Description: Public (DCNR) and privately owned land. This site is the northernmost extension of the Blue Ridge Mountains. The cover is mixed forest area with Hemlock, White Pine, Red and White Oak, Maple and Laurel predominating. The site geology is quartzite and sandstone bedrock. A dense understory of Rhododendron occurs in stream valleys. 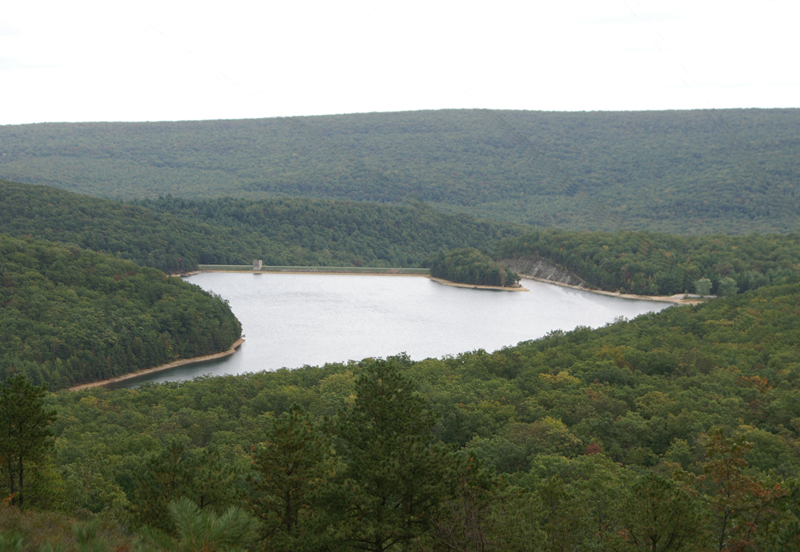 Michaux State Forest contains 3 State Parks: Caledonian, Pine Grove Furnace and Mont Alto, with King’s Gap Environmental Center towards the northernmost edge. Birds Summary: This area is the northernmost section of the Blue Ridge Mountains in Pennsylvania and contains interior forest species. During migrations and summers, the mixed forest attracts Wood Thrush, Veery and Ovenbirds. Laurel Lake and 2 large reservoirs attract waterfowl and wadding birds including Wood Ducks, Common Loon, Pied-billed Grebe, Common Merganser, Canada Goose, Mallard, Great Blue Heron, and Green Heron. Whip-poor-wills are present. Many foot trails exist within the state forest area. Several rock outcroppings provide views of raptors during the fall migration season. Representative Birds by category: 1e: large, outbroken areea with diverse forest-interior species. 4b: a mix of northern and southern birds, supports high densities of Hooded Warbler and Eastern Pee-Wee, includes populations of Canada Warbler, Hermit Thrush, Kentucky and Worm-eating Warblers. Conservation issues: Threats and pressures on this area include recreational overuse from all-terrain vehicles. ATV/Off Road Vehicle use has been reviewed in a joint effort by the Bureau of Forestry and the Game Commission, and some roads have been closed to reduce impacts on wildlife. Passive recreational use includes cross-country skiing and hiking, which have little impact on forest habitat health. Greater involvement from passive recreational interests and private cabin owners is needed. Local Contacts: Michaux State Forest (717) 352-2211; Caledonian State Park: (717) 352-2161. Directions: From Chambersburg, follow Route 30 east for approximately to intersection with Route 233. This is Caledonia State Park. Turns for Long Pine Reservoir, Laurel Lake, and Pine Grove Furnace State Park will be found by taking Route 233 north for several miles. Acknowledgements: Thanks to Valerie Barnes and Conococheague Audubon for passing on this information. Copyright: the National Audubon Society. Nomination: this Important Bird Area was nominated by Joan Bowen and Elizabeth Johnston, c. 1999.